We have put together a list of our systems that have been specifically manufactured to suit certain uses. So, if you are wondering which system you need for your latest project the information below will benefit you. If you require more information following our guide please contact our technical team. Sliding doors open up a whole new world of flawless function and practicality, offering clever space saving alternatives to traditional door systems. Häfele’s sliding door gear offering ranges from systems suitable for furniture and residential use, to heavy duty commercial environments. Exterior sliding doors are perfect for creating immediate access to outdoor areas and transforming a room setting by enhancing natural light. 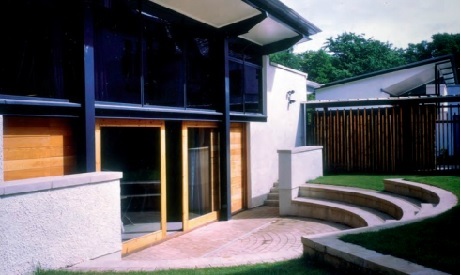 Our range of exterior sliding fittings offers exceptional durability. 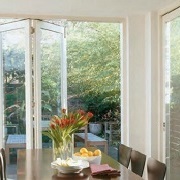 Our range includes straight sliding patio doors and shutter systems, ideal for windows and shutters. This system offers maximum versatility for projects that require either interior or exterior application. The system is designed for straight sliding timber partitions, fully glazed patio doors or for use on flush panelled doors. This system is available on special offer. For sliding door specifications complete the form and for quotations, please contact our Estimating Team on 0800 171 2907. The galvanised corrosion resistant stainless steel on the Straightway Bottom Rolling Systems offer both phenomenal durability, even in harsh environments, with a beautifully flawless finish. All of the systems in this collection are ideal for internal or external application. The Straightway 700 Bottom Rolling is ideal for application in environments that require extreme climatic conditions, such as hospitals or buildings within the food or chemical industries. For environments that require support for a heavier door weight and height, the Straightway 710 and 720 are heavy duty variations of the 700. Find our complete range of heavy duty sliding & folding door gear online. 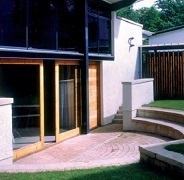 Exterior sliding and folding doors offer the same benefits as sliding exterior doors, with added folding functionality. Our exterior sliding folding door systems provide exceptional durability, providing a solution that offers maximum protection against all of the elements, ideal for shutter systems. 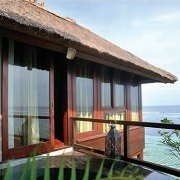 The Hawa Frontfold 20 is ideal for sliding and folding timber or aluminium shutters. 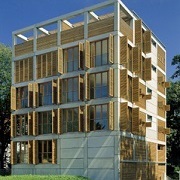 Shutters can be installed for windows or balconies to optimise solar gain and minimise overheating in glazed areas, such as offices or flats. Exclusive to Häfele, the Slido 100-U System is ideal for smaller commercial projects, where external doors with high security features are required to open a room out into an external space. Made in the UK, with full security and weather protection, the high-quality system allows for the fluent and quiet movement of doors. Available to order online, quickly register an account to view prices. Interior sliding doors are ideal for sectioning off areas, opening and merging areas and ultimately giving the user complete control of room boundaries. Ideal in situations where rooms must be flexible, such as meeting rooms, childcare environments or in the hospitality sector, these solutions provide versatility and are an extremely popular design choice within commercial settings. At Häfele, we have an extensive range of extremely popular interior sliding door systems, suitable for both side and top hung fixings. Developed by our team of experts, the Häfele Telescopic Bi-parting system is ideal for commercial application where two, three or four straight timber doors are required to slide together. 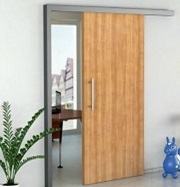 Soft close is standard for two doors bi-parting, telescopic and four doors telescopic bi-parting. This high quality Slido Design 80-M Sliding Door System allows for the effortless glide of wall mounted doors across openings, creating the seamless illusion of floating. The unique system design means all tracks and fixings are hidden, ideal for commercial application in environments such as hotels or offices. This is a high-end offering that comes without the luxury price tag. For environments that require noise reduction, such as offices, studios or outlets, the Classic 80-S Sliding Door System from Slido has increased soundproofing to help keep noise contained. 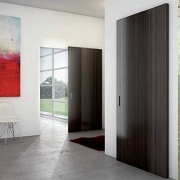 This system is suitable for installation in areas where hinged doors are used and is available exclusively from Häfele. 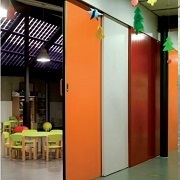 Pocket sliding doors are extremely popular in commercial environments that are open plan of limited for space. These systems illuminate the need for the opening and shutting space required on standard doors and are ideal for disappearing doors, in a ready-made cassette or kit form. These systems fit into plasterboard and are popular within commercial projects such as office space and within the hospitality sector. With standard UK door sizes, sliding door cavity walls can be easily installed, creating both cost efficient and space saving benefits to a project. The high quality Xinnix Hawa Junior 80 system is the perfect example of this, complete with frame stud work, to seamlessly create a 100mm finished wall pocket, using the Hawa Junior 80 sliding system. With exceptional high quality, the unique design of the Slido Classic 160-B allows doors up to 55mm thick to be installed with a finished wall of 100mm. 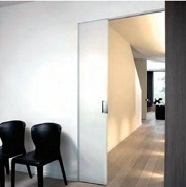 This seamless sliding door system is for application exclusively with single doors and creates a truly luxurious finish. The kit can be easily cut to suit standard UK door sizes or large custom doors and once cut, can be installed in 10-20 minutes by a skilled installer. 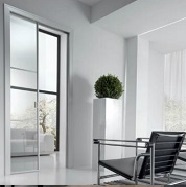 Sliding glass interior doors create maximum visibility in a room setting whilst maintaining room boundaries, ideal for offices or shower rooms. Our range of interior sliding glass systems are engineered to suit a variety of toughened and laminated glass, as well as shower doors. The Hawa Super 250/G system is ideal for creating visibility in commercial environments where items are required to be on display, such as in a retail setting. 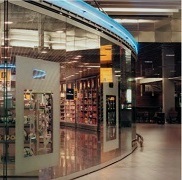 This system is for larger straight sliding glass doors, whether required on curve or straight tracks. The exceptionally high quality of this system ensures seamlessly smooth movement with minimal quiet sliding action. This system is available to order via our internal team. Please contact our Estimating Team at estimating@hafele.co.uk or on 0800 171 2907 for quotations and project specifications.